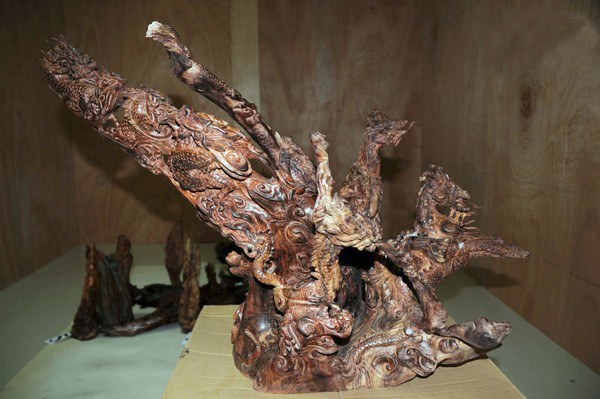 On Feb. 23rd, 2011, Sanya police busted a burglary gang blamed for the missing rosewood artwork in Lizhigou, Jiyang County, Sanya, reports 0898.net. 4 suspects have been arrested and the police have recovered stolen rosewood art items worth nearly one million yuan. On the evening of Jan 26th, driven by making huge profits, the suspects drove a car from Ledong Li Autonomous County to Sanya and broke into a wood-carving shop to steal the valuable rosewood art items. For fear of being discovered by the police, one of the suspects even buried 10 pieces of rosewood artwork into his betel nut tree yard. After receiving a call, police in Hedong District attached great importance to the crime and finally caught the suspects in their residences after a half-month long investigation. According to police, they have recovered a certain mounts of the artworks but some of them had been sold by the criminals at RMB 1000 per kilogram. At present, Sanya police are trying to look for the other two suspects who are still at large.